You'll love Gamie's ring toss outdoor set! It comes with (5) 15" tall inflates, (5) 7"
of the rooms and go wild. - Creates hours of fun for both kids and adults. - Can be played either outdoors or indoors. - Easily accommodates up to 5 players for inclusive fun. - Weighted inflatable bases stand conveniently upright. - Vibrant colors allow for easy visibility even at a distance. some fun carnival magic and ensure everyone has an absolute blast. Click 'Add to Cart' now! 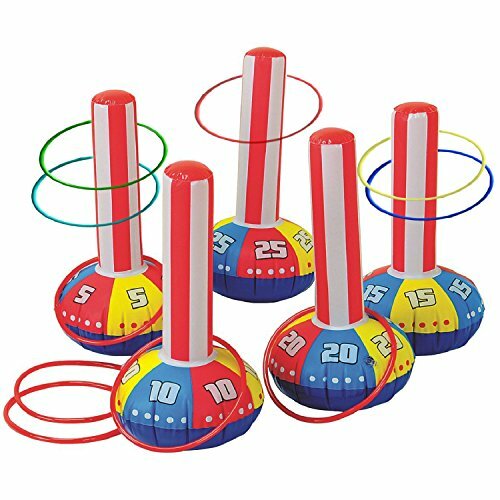 HAVE A BLAST: This mega fun ring toss games includes (5) 15" tall inflates, (5)" diameter flexible rings, and (5) sturdy neon carnival rings. This makes one of the most fun outdoor and indoor games for kids and adults, and is perfect for adding a carnival feel to any party. FUN AND CHALLENGING: This is that inflatable ring toss game your family will never grow tired of. Not only does it work as one of the best indoor & outdoor yard games, but the inflatable bases and rings can all float, allowing you to place them in a pool and create a water ring toss game that will make for hours of incredible fun. IMPROVES MOTOR SKILLS: The aiming nature of these outdoor lawn games hones the little ones' motor skills and dexterity, improving their hand-eye condition all while having an incredible blast. These carnival games for kids also encourage them to get out of the house and get active. STAYS IN PLACE: The (5) 15" tall inflates are weighted with bean bags to keep them standing sturdily upright whether placed on the ground or floating on water. And with the set designed in vibrantly bright shades, these carnival party games will add some cheer to any setting. ENJOY QUALITY FAMILY TIME: The whole family can get in on the action and create fond memories alongside all the fun. These fun games for kids and adults can accommodate 2-5 players and are suitable for players aged 4 and up. Click 'Add to Cart' now! If you have any questions about this product by Gamie, contact us by completing and submitting the form below. If you are looking for a specif part number, please include it with your message. Elite Hookey Ring Toss Game - Safer Than Darts, Just Hang it on a Wall and Start Playing. Fun Outdoor Games for Family. It's Beautifully Finished and Easy to Set-Up for a Man Cave, Home or Office.